Belgian talent Thomas De Gendt has impressed early on this season, finding his way into long breakaways that have been foiling sprinters from Australia to France. He showed glimmers of his potential last year, being one of a small handful of Topsport-Vlaanderen riders who scraped out admirable results against bigger teams and more experienced riders. This no doubt propelled him to a contract with Vacansoleil, and in 2011, the 24-year-old showed his talent early. At the Tour Down Under, he joined the breakaway on Stage 4 that ultimately finished 24 seconds in front of the field and put Garmin-Cervelo’s Cameron Meyer into the leader’s jersey. Meyer would hold until the end of the race. Though he finished second on the stage and third in the Sprint Classification, De Gendt wouldn’t reap as many benefits from the break as Meyer did. However, it was the first of a series of similar moves from De Gendt, which have culminated in his reclamation of the Paris-Nice leader’s jersey halfway through the eight-day stage race. De Gendt claimed Stage 1 when he, Jens Voigt, and Jérémy Roy clung tenaciously to a 25-second advantage in the final 10 kilometers as a panicked peloton chased them toward the red kite. The peloton closed the gap, but it was too little, too late: De Gendt held off the sprint of Heinrich Haussler, Peter Sagan, and Greg Henderson to win the stage and don the race-leader’s yellow jersey. He wore the yellow jersey well. On Stage 2, he took a flier inside of 2km to go, as if to say, “Look at me, everybody – I like wearing this jersey.” Unfortunately for him, he lost the race lead in a chaotic finale of Stage 3 – a twisting run-in to the finish at Nuits-Saint-Georges caused Peter Sagan to tumble in the final corner, further spreading out an already segmented field; Matt Goss took over the race lead. That could have been the last we’d hear from Thomas De Gendt, but today’s Stage 4 saw him in a five-man breakaway with Europcar’s Thomas Voeckler, FDJ’s Rémi Pauriol, and Astana’s Rémy Di Gregorio. Voeckler, the French National Champion, is a good man to be in a break with while on French soil, and the camera moto offered viewers numerous head-on shots of the foursome as they entered the final 10k with a bit over a minute’s advantage. De Gendt was in a strong position, as another moto caught plenty of shots of Goss dangling at the end of the peloton, on the verge of getting dropped after 192 hilly kilometers. De Gendt played it smart – rather than being seduced by another stage win, he drove the four breakaways hard toward the line, ultimately finishing third but potentially gaining a few seconds over the peloton by avoiding the cat-and-mouse games in the final few hundred meters. “You take the win – I want the time.” The yellow was his again. It will likely be difficult for De Gendt to defend the yellow all the way to Nice, as the race finishes with four very hilly stages, but I don’t think he needs to weary yellow all the way to the end to put his mark on the race. Given this success this season – which he attributes to giving up sausage – we have to agree with his young girlfriend, Evelyn Tuytens: de Gendt has really earned his balls. 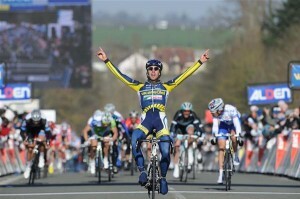 This entry was posted in Featured, Races and tagged de gendt, paris-nice, vacansoleil. Bookmark the permalink. Dutch talent, with that name? He's Belgian! Indeed he is – my on-the-fly editing occasionally fails me. Thanks for keepin' us honest and accurate. He's an interesting rider – he spent a huge amount of the 2009 Tour of Britain on the attack, winning the mountains and sprints classifications, but without winning a stage his efforts deserved. He's doing much the same this week, and getting his rewards. After the Ricco debacle, Vacansoleil must be delighted to be getting so publicity for the right reasons. I actually texted to my buddy today that "De Gent's balls are on his top tube!" It was a great ride! I hope he goes on to piss off the favorites more! I just hope he clean…like my hopes with Gilbert. Put those stupid dopers away and let's celebrate the new young talent! my brother thomas is riding on the bike from the age of 2,5. a bike with fat tires and a steeringwheel like a racingbike. he chased me as i was practicing because i was 15 and doing cyclocross and MTB. he was the only brother of 4 who liked to look at my races. when he reached the age of 6 he started to race in holland (Kristoff Goddaert AG2R allong with him) and already from the beginning he road like hell and all alone in the lead. if he was in the bunch he never chose a wheel, he just road in the wind. many years of racing and winning has gone by and he has gained power in his legs because of his agressive and lonesome rides. every year he stepped up without taking a to big step, just slowely. Jurgen, thank you for your comment! You must be very proud of Thomas. I look forward to watching him in more races.